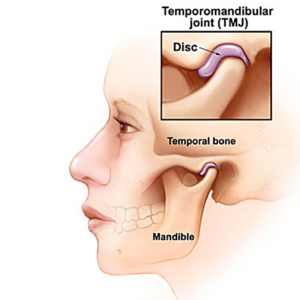 I recently had the opportunity to attend a full day lecture on temporal mandibular joint (TMJ) issues and related health challenges. It turned out to be extremely informative! The TMJ is the joint that hinges the lower jaw. There is normally a disc between the head of the joint as it sits in the fossa in the skull near the ears. When that disc gets worn, it can displace, and get stuck out of place. That then can manifest into a clicking of the joint as the jaw opens and closes. If the tissues of the joint become inflamed, it can be very painful. Treatment for this involves taking the joint into a position that is more ideal, and allowing the inflammation to resolve. There are various types of orthotics that can put the jaw into a better position, and each treats a different scenario. Related to a displaced TMJ, is a situation where the bite is not ideal. How the upper and lower jaw meet together can affect how the TMJ fits together. It can then also affect the airway in which you breathe, if the jaw is forced backwards closing off the airway. To compensate, you might start tilting your head forward to open up the airway. That then places more weight forward for your neck and shoulder muscles to support, and possibly result in headaches and shoulder aches. So if your posture is poor, it might be related to how your bite fits! And staying on the subject of airway, especially for younger children, the lecturer gave the indication that enlarged tonsils and inflamed adenoids can obstruct airways. To compensate, the kids become mouth breathers. When they do this, the arches of the teeth become narrow, as there is no stimulus to grow wider without the mouth closed and the tongue pushing outwards. Sometimes the kids might start clenching and grinding their teeth, which is a natural way to tense up the neck muscles which then opens up the airways. Doesn’t mean that every child that grinds has an airway problem, but it should be examined as a cause. As a side note, this is why I like to have kids see the orthodontist when there’s a lot of crowding of the teeth around age 8. If the dental arches can be widened to make space for the teeth, there is a bonus benefit of opening up the airways for better breathing. I’ll be doing more research on this topic and probably attend some related lectures. Cool stuff!